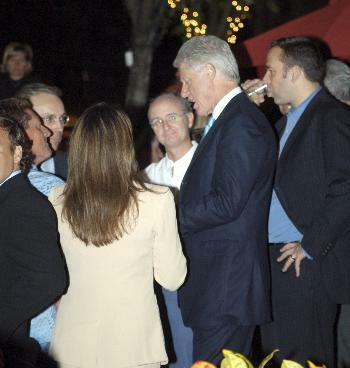 Former president Bill Clinton unwinds early Tuesday morning at Noir in Cambridge. Shortly before retiring for the morning, Clinton defended a passage in his autobiography that describes a disputed exchange with Kennedy School professor Roger B. Porter. Hours after his address to the Democratic National Convention, Bill Clinton was back on the offensive, flatly dismissing allegations that his recently published autobiography included a fabricated account of a conversation with Kennedy School of Government professor Roger B. Porter. In an exclusive interview in Cambridge early this morning, Clinton told The Crimson that Porter’s claims about the book, My Life, were simply “not true.” But, despite the hour, Porter wasted little time answering right back, sharpening his criticisms of Clinton’s account and expanding their scope. Clinton had written in his memoir that Porter, who was Economic and Domestic Policy Adviser under President George H. W. Bush, had fired a warning shot at him. In June, after the autobiography was released, Porter said Clinton’s account was untrue, a charge the former president rebutted this morning. But Porter scoffed when told of Clinton’s reply, noting that he would certainly remember so important an exchange. According to Clinton’s book, Porter—who is Dunster House Master and IBM professor of business and government—said that while other potential Democratic opponents could be undermined through weaknesses grounded in their politics, the Arkansas governor’s voting record made him “different.” According to Clinton, this also made him a prime candidate for a Republican-orchestrated smear campaign. Clinton cited conversations he had immediately after the phone call to support his version of the account. “As soon as I hung up the phone, I called Hillary,” Clinton said this morning, “and then I called Mack McLarty,” his future chief of staff. But Porter told The Crimson in June that the only conversation he can recall with the Arkansas governor came during President Bush’s 1989 Education Summit with the Governors, where he joked with Clinton about how the rising politician ought to run for president in much the same fashion as Ronald Reagan—as a Republican.